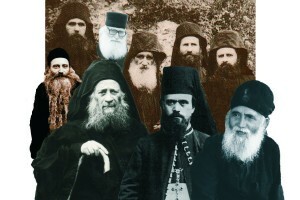 The Elders featured are all ‘modern’ men of the 20th Century who lived in the ‘modern’ world but also in that the the world of timeless monasticism. This page is meant as a brief introduction as to why they are our primary sources, not a detailed biography. Seraphim Rose (1934-1962): American Orthodox convert and founder of St. Herman’s Brotherhood in Platina, CA, he was a prolific writer introducing traditional Orthodoxy to the modern Western world. Of all of those included he is less an elder in the traditional sense than a teacher and evangelist. If we view most elders as giving us ‘meat’ to attain higher spirituality, then Elder Seraphim and his publishing house have provided the needed ‘milk’ of foundational Orthodoxy. 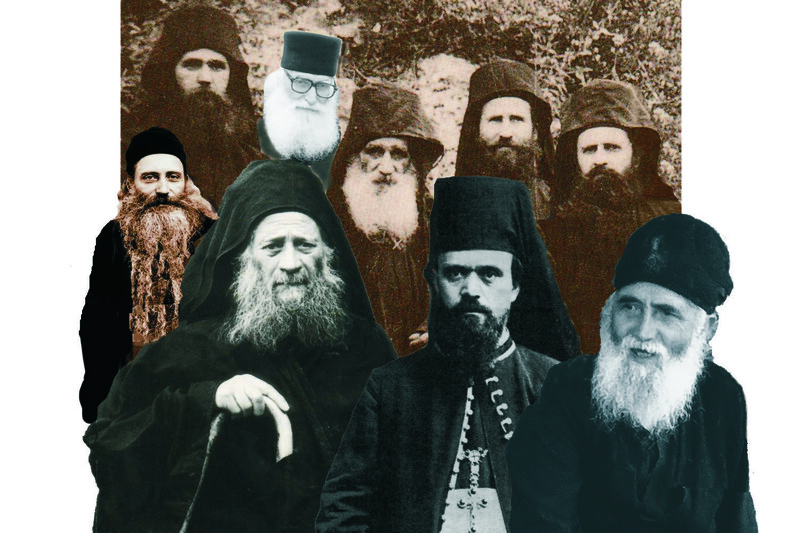 Elder Joseph the Hesychast (1897 – 1959) This Elder has perhaps made the widest impact of all of the elders featured since all of those men on the second row were his disciples. Coming to Mt. Athos and finding if difficult to find a elder to guide him in noetic ‘prayer of the heart’ he and his companion Arsenios struggled severely and reached great heights of spiritual theoria. A true staretz (spiritual guide) he still guides us today through the letters he wrote and his direct formation of his disciples who were to literally tranform Mt. Athos in the decades after his death. St. Nikolai Velimirovich: (1880-1956) St. Nikolai can perhaps be called an ‘elder to the laity’ since his work and counsel was directed to everyday Orthodox men and women in Serbia, American and throughout the world. Through his voluminous writings, including the ‘Prologue of Ohrid’, we shows how to apply the teachings of Christ and the Church Fathers to everyday life. Elder Paisios: (1924-1994) The Elder loved stillness and solitude but sacrificed it to help the thousands who came to him with prayer and God-inspired advice. He resided mostly on Mt. Athos but due to the diligence and foresight of a Sisterhood in Souroti and others who wrote down much of what he said, we have a greater volume of his teachings and anecdotes than from many other modern staretz. Elder Ephraim of Arizona (1927-): He is the only Elder still living . After serving Elder Joseph the Hesychast until the latters passing in 1959, became Abbot of the Athonite Monastery of Philotheou in 1973. After revitalizing Philotheou, he traveled to North America where he eventually founded 17 monasteries, residing in the desert today at St. Anthony’s Monastery in Florence, Arizona. In addition to forming monks and nuns in the spirit of Elder Joseph, he also helps the laity through personal counsel and through several books which detail the struggles and triumphs associated with the prayer of the heart. Elder Ephraim of Katounakia: (1912-1998) The Elder was a disciple of Elder Joseph’s but was technically not a member of his Brotherhood. ‘Papa’ Ephraim advanced rapidly in the prayer of the heart which Elder Joseph credited to his humility, purity and obedience. Throughout his his life Papa Ephraim taught ‘obedience is life’. This is also the title of a book that relates the anecdotes and teaching from his life. Elder Arsenios: (1886-1983) The Elder was such a humble monk that he submitted himself to the guidance of Elder Joseph which the latter was still a layman. For the next 40 years the two struggled together and advanced to great height of noetic prayer will engaging in extreme feats of asceticism. After Elder Joseph’s repose in 1959 Elder Aresenios was regarded by the others the senior Elder even as they left and formed Brotherhoods of their own throughout Mt. Athos. Elder Arsenios guides us through the spiritual teachings passed on from those who knew him. Elder Joseph of Vatopedi: (1921-2009) After 1959 he was the ‘Elder’of Joseph’s Brotherhood but did so in great humility until 1987 when he relocated to the Monastery of Vatopedi. Aside from direct counsel to many monks and laity, Elder Joseph also has written several books detailing the life and teachings of his Elder and fellow Brothers which shed light on the hidden lives and wisdom ff these great strugglers. Elder Haralambos: (1910-2001) The nephew of Elder Arsenios was trained in asceticism by Elder Joseph until his repose. In 1964, the first small brother led by Haralamobos began to form and grew through the years. In 1979, the Elder became Abbot of Dionysiou Monastery on Mt. Athos and led its revitalization. The Elder’s teachings, passed on to his disciples and other have been recorded in at least one book for our benefit.